SerpApi is the best way to get Google search results in your applications. It’s an easy-to-use and real-time API. We handle the issues of renting proxies, solving CAPTCHAs, and correctly parsing rich structured data for you. We also run full browsers for each search that guarantees that you get what users truly see. SerpApi is really easy to integrate, directly as simple HTTP requests, or via our official libraries in Python, Ruby, NodeJS, Java, PHP, and Go. 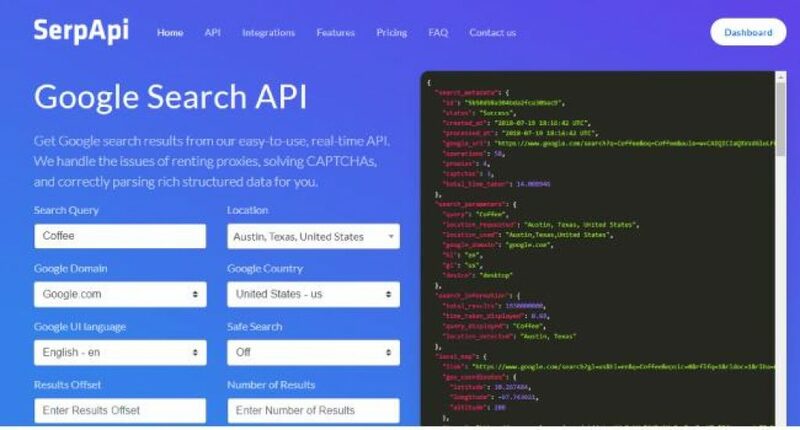 Get Google search results from our easy-to-use, real-time API. We handle the issues of renting proxies, solving CAPTCHAs, and correctly parsing rich structured data for you. What problems does SerpApi solve? It’s unbelievably hard to scrape Google search results. It requires a large pool of proxies, to find solutions to solve CAPTCHAs, and to parse many complex Google HTML structures. We make it super easy. Coding, and SEO tools for more than 10 years. Julien Khaleghy – CEO and Technical Founder. Been coding since I was a kid. I love architecting and implementing ambitious ideas into concrete solutions. I have robust skills in coding and as a technical lead, and I love using both in a dynamic team.10+ years working in digital marketing. Passionate by code since childhood, Have founded a few startups and always eager to learn more!. live in Austin, Texas, United States. SerpApi is the best way to get Google search results in your applications.